On arrival at the airport, you will be met and escorted to your hotel. 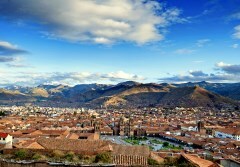 After some time to check in we introduce you to our city with the "Locals' guide to Cusco". This short walking tour is a great way to get your bearings and also helps you get used to the altitude. The beautiful historic centre was declared a World Heritage Site in 1983 with Inca and colonial architecture evident all around. This evening your guide will give you a full briefing for the adventure ahead. 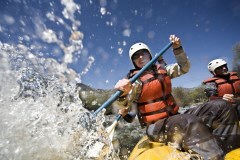 Today the fun really begins as you challenge the Grade III-IV rapids of the Upper Urubamba river. Our expert guides will give you a thorough safety briefing and the best equipment in the country. Fully prepared you launch from the bank and off down the finest one day section of whitewater in Peru. 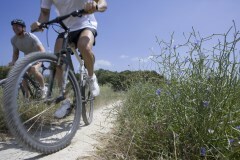 Whether you are a beginner or expert you are sure to finish with a grin from ear to ear. Once you have changed into dry clothes you can enjoy a delicious picnic lunch on the banks of the river before the short drive to Pisac. Here you can explore this famous handicraft market with the help of your guide. Perhaps you can try one of the tasty empanadas fresh from the old town oven. This ride is perfect for families: its versatility means it can be easily adapted to suit every level and age. It’s an incredibly scenic ride, combining Andean mountain passes, gentle descents and a lovely amble through the heart of the Sacred Valley of the Incas. We begin with a fifty minute drive to Pisac. At this small town based in the Sacred Valley of the Incas we can stop for a stroll around the lovely plaza and artisan market stalls. 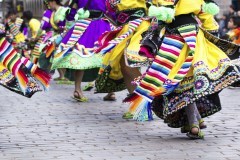 Your five day Inca Trail is carefully tailored to avoid the crowds. By leaving later than everyone else, and allowing an extra day, you spend the whole trail out of sync with other tourists. Thus you will literally have the trail to yourselves. 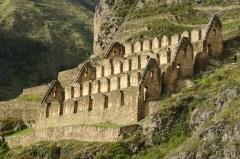 This morning you visit the old Inca town of Ollantaytambo. After a look around and some lunch you have a short drive to the trailhead at Piscacucho (km 82). Here you meet the porters and cooks that will support your journey to Machu Picchu. With the crowds now long gone, you hike an undulating trail above the Urubamba river to camp beside the spectacular ruins of Llactapata (2,788m/9,146ft). Whilst walking all you need to carry is a daypack. Your luggage is carried by the porters, your tents are put up for you and your food is prepared for you. All you have to do is shoulder your daypack and enjoy the walking. After a hearty breakfast you climb gently up the Cusichaca valley to the small hamlet of Huayllabamba. This is the last inhabited place on the trail. A little steeper now, you head up the beautiful Inca path, past hummingbirds and stunted cloud forest to your camp at Llulluchapampa (3,680m/12,073ft). This beautiful grassy area has outstanding views and you may be even see the Andean deer that come to feed here. Today is the most challenging day but also the most exhilarating. You climb to Dead Woman’s Pass (4,212m/13,819ft) the high point of the trail before dropping into the Pacasmayo valley. Climbing once more you pass the Inca control post of Runkuracay to the second pass of the day (3,998m/13,117ft). On a clear day there are spectacular views towards Pumahuanca mountain in the Vilcabamba range. 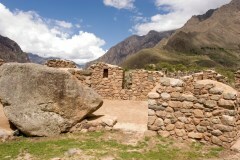 You continue on well preserved Inca trail to Sayacmarca. Located at the junction of two old Inca roads, historians still argue over its exact purpose. A few more gentle ups and downs and you arrive to your stunning campsite for the night, Phuyupatamarca, or ‘the place above the clouds’ (3,650m/11,975ft). This is the day you finally reach Machu Picchu. As you step out of your tent the views are stunning. Perhaps you will see the sun rising over the snow capped mountains of Salkantay (6,200m/20,341ft) and Veronica (5,800m/19,029ft). Or perhaps you will have a cloud inversion, with the clouds filling the valleys beneath your feet. 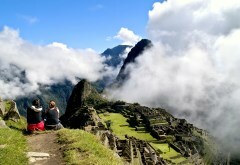 After saying a fond farewell to your porters it is time to put on your boots and head to Machu Picchu. You descend through the cloud forest on beautiful Inca stairways, to Winay Wayna, another interesting ruin full of swallows and orchids. Finally you contour the hillside to arrive at Inti Punku, the gateway of the Sun. 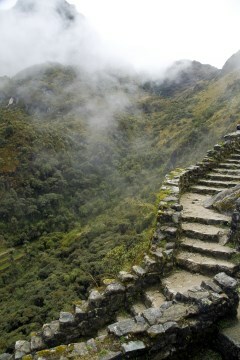 As you step through the old stone gateway Machu Picchu appears laid out before your eyes. After plenty of photos you carry on past this wonder of the world to catch the bus down to the colourful town of Machu Picchu Pueblo and a well deserved hotel and shower. Back once more in the old Inca capital you have time to enjoy all that this city has to offer. Museums, chocolate making classes, souvenir hunting or even just sitting in one of the many cafes and watching the world go by. The new late flights out of Cusco allow you to really maximize your time and get the most out of this holiday of a lifetime. For those with more time we can offer you extensions to the Amazon rainforest, Lake Titicaca, Colca Canyon and Arequipa or even to the little visited northern Peru.